Abigail O’Shields sends a pitch to homeplate in IR’s 4-1 loss to Lake Forest on Monday, May 21. 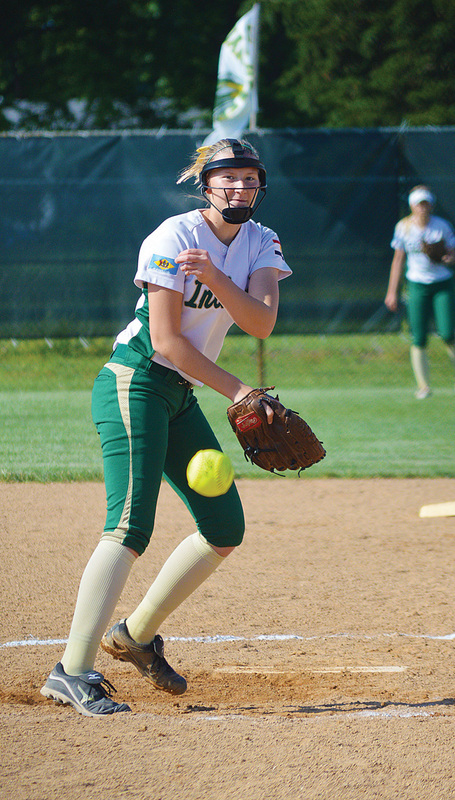 Stymied all game by Lake Forest senior pitcher Kaitlyn Stahre, the Indians could only muster six hits in a 4-1 defeat to the Spartans, ending their 2018 campaign with a 13-6 overall mark. “She kept us off-balance for two full games now,” Indians head coach Erika Murphy said after Monday’s game, while also referring to IR’s 6-1 loss back on April 21. “We just didn’t make, as a team, enough adjustments to put the ball hard in play against her like we needed to. Junior catcher Grace Snyder was the only Indian to get multiple hits in the game, going 2-for-2. Morgan Bomhardt, Kayler Townsend, Braydee Whitman and Kaylah Briddell had the other IR hits in the game. Lake Forest’s Kayla Townsend did the most damage in the game, with a two-run home run and a double. Brittany Baker had the other big hit for the Spartans, with a two-run single in the top of the seventh that put the game away for the visitors. The Spartans got on the board first in the top of the second inning, when Stahre lined a leadoff single to center. Then Townsend stepped to the plate and drilled an 0-1 pitch over the fence in left for the early 2-0 lead. The Indians had a chance to answer back and get on the board in the bottom of the third inning, when Morgan Bomhardt started things off with a single. Snyder advanced her to second on a sacrifice bunt. Kathryn Collins then walked, to put runners on first and second for Julia Bomhardt. But a hard-hit grounder turned into a double play, ending the threat for the Indians. IR had another golden opportunity to get on the board in the bottom of the sixth, as Kayler Townsend and Whitman each had one-out singles. Briddell plated Townsend with a sacrifice-fly to right to cut the score to 2-1, with Whitman advancing over to third. Pinch-hitter Jess Rybicki went down swinging to end the rally. Lake put the game away, for all intents and purposes, in the top of the seventh, thanks to a pair of runs on a two-run single by freshman Jessica Reed to right field, putting the Spartans up 4-1. The Indians had one last glimmer of hope in their half of the seventh, but only Snyder could muster a two-out hit before the final out of the game and season came about. It was the final high school game for Indian River seniors Julia Bomhardt, Damyah Williams and Bradee Whitman. Pitcher Abby O’Shields took the loss for IR, allowing all four runs (three earned) in the complete-game effort. She struck out five and issued just one intentional walk in the contest. Extra bases: The Henlopen Conference South Champion Indians committed two errors in the game, while the Spartans played mistake-free defense. Stahre allowed the six IR hits and offset a walk with four strikeouts. It was a disappointing — and quick — end to a season that had so much promise for the Indians, who had advanced all the way to the DIAA semifinals last year.